The vast majority of Americans admit to watching TV in bed. So, with flatscreen TVs popping up in virtually every other room in the house, should you consider a TV in the bedroom? There are pros and cons, of course, so here are four key things to consider. 1. Should You Put a TV in the Bedroom? Instead of flopping out on the couch late into the evening, you could watch TV from the ultimate comfort of your own bed. If that sounds good to you, putting a TV in the bedroom could be a smart move. Besides, there are practical reasons, too. What if your kids want a TV in the bedroom? Lots of parents struggle with this. On the plus side, the kids can watch Moana for the 19th time in their room while you adults watch whatever you want in the comfort of the living room or media room. Or they can watch Saturday morning cartoons, leaving you with peace and quiet to slowly surface for the day with a giant mug of coffee. On the other hand, are the kids likely to watch even more if there’s a TV in their room? Pediatricians recommend a maximum of 2 hours per day, and they warn that watching TV right before bed inhibits sleep. Also, it will be harder for you to monitor what they’re watching. If you do agree to a TV for the kids’ room, be sure to choose a wall mount designed for safety. 2. What About TV Size for the Bedroom? Consider the distance from your bed to wherever you plan to put the TV, as well as how much you intend to watch. A small flatscreen may be fine for catching the morning news, but you’ll want a bigger screen for movies. A small flatscreen can be made to seem bigger, though, by using a full-motion mount to bring the TV closer to the bed when you're relaxing late night with your favorite movie. If you want to avoid bothering others in the house or your snooze-mate, invest in a good pair of cordless headphones. You may also want to install a light dimmer, so you can have just a bit of ambient room light. Total darkness causes eye strain, and let’s face it – low light adds that just-right romantic touch to Movie in Bed Night. 3. Where Should a TV Go In Your Bedroom Layout? Most people naturally think that you have to put the TV right at the foot of the bed. But there are multiple configurations that would work well. 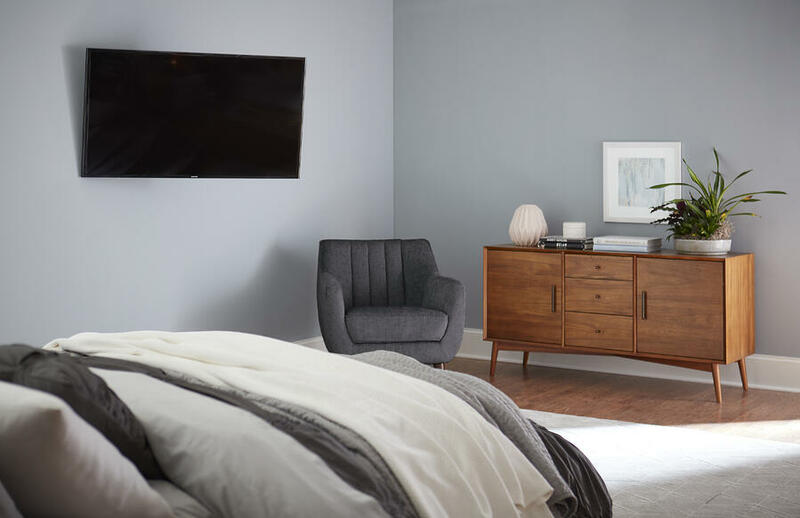 Bedroom layouts can vary widely, so the best location for a TV in the bedroom depends on the size and shape of your space, as well as your furniture arrangement. Installing a corner TV mount could be your smartest plan since corners are often unused space. If the foot of the bed appeals to you, you could mount the TV on a pedestal, set it on a cedar chest or get a cool retractable unit that rises from a narrow cabinet at the foot of the bed, then slips away again for storage. If you're thinking about mounting the TV in your bedroom, check out the video below where Lauren shares how mounting your TV opens up your layout options. 4. How High Should I Mount My Bedroom TV? As you determine where to put your bedroom TV, you will also want to take into consideration the height options for each potential location. Remember that the ideal bedroom TV height may not be the same as it would for a living room. You will most likely be laying in bed as you watch TV, so it's ideal to mount the TV a little higher than your line of sight. To determine the proper placement, you might want to enlist some help. One person can lay in the bed while the other marks the right place for the TV. The type of mount you choose to install will also dictate which height would work best for the most enjoyable viewing experience. If you have a tilt or a full-motion mount, you are able to have a more versatility and comfort for where and how you view your favorite shows. 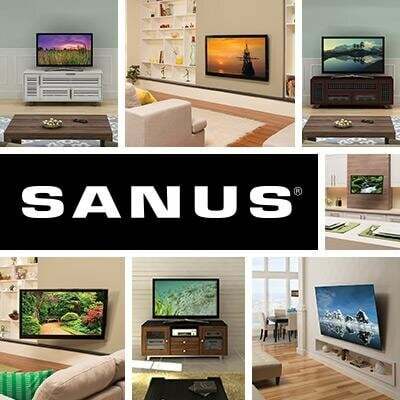 No matter what location and height you choose, SANUS makes corner, ceiling, and wall mounts that turn your bedroom TV ideas into reality. Then, all you’ll need is some extra-plump pillows and you’re ready to watch TV in the bedroom.